Hello ... Hello ... my old friends ... It's great to see you once again! Mention the name Jim Onslow and immediately you are reminded of his immense contribution to 'Brum Beat' trailblazers Gerry Levene & The Avengers as well as, of course, Denny Laine & The Diplomats and not a few other famed Midlands bands. But there is much more to his career. The man who shared the stage with The Beatles at The Cavern, Roy Wood, Bev Bevan, Graeme Edge [later of The Moody Blues] has also enjoyed a rewarding solo career based in and around the West Midlands and Shropshire since. 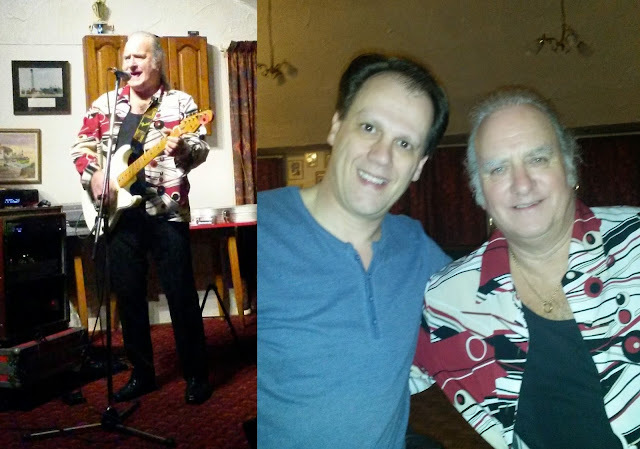 For those reasons, a trip to see Jim Onslow performing at one of his solo shows has, for me, been long overdue so the twenty  mile jaunt to Newport to see him perform last night [Saturday 8th November] at the welcoming Royal Naval Association Club was a real must. In a set that covered five decades of music, Jim delivered an entertaining and amiable performance of over forty  songs supported by his own recorded backing tracks. Jim sang and played the guitar in a fashion that much reminded me of those wonderful solo gigs by Kelly Groucutt in the nineties. Highlights, for me, were many but his versions of "You Got It", "Out Of Time" and "I Saw Her Standing There" were memorable. Jim [and his wife Annie] were very open and accommodating and we talked extensively about his career up until the present day. It was a real pleasure to meet up with him and to see a 'proper' musician performing real music at a time when pubs, clubs and venues are struggling to survive. If Jim Onslow is gigging near you, Go see him! ELO Beatles Forever [ELOBF] recommends Jim Onslow to those enlightened folks who enjoy the music of ELO, Jeff Lynne, Roy Wood, The Move, The Idle Race, 'Brum Beat', The Beatles and related artistes.